1. Is Strava Giving Away Secrets?! If you missed the news this week, Strava went live with their Global Heat Map.This showed where Strava connected devices have been active. It includes a cool look at major cities, and common trails, but also includes some data from possible secret US military activity in other countries. As you could imagine, this could create a problem. Check out your city on the Global Heat Map. 2. Shalane Flanagan In A Super Bowl Commercial! Shalane Flanagan, last years New York City Marathon Winner has a few reasons to be happy this year. Not only does the Massachusetts native get to watch the Patriots in the Super Bowl, but she is also in a Super Bowl Commercial! The spot is for Michelob Ultra, and stars Chris Pratt! Check out Shalane at the 10 second mark in the commercial here. 3. Running a Marathon With Meaning. 4. The Streetwear Influence On Men’s Running Gear. Running wear, and specifically Men’s Running wear has been popping up with an extreme street influence. The rise of “Urban Running Groups” and the “”Hype Beast Economy” is showcasing itself in new, high priced running brands. We like the idea, but c’mon, $288 for some running shorts? We love to find things that help us stay safe on the track, trail, or treadmill. It’s especially great when we find something that will allow us to do so with less clutter on our wrists. Enter the 1BandID, an Id tag that attaches to the running watch you already wear. Its great for those that don’t want an extra bracelet, but still want that little piece of info that could save your life. 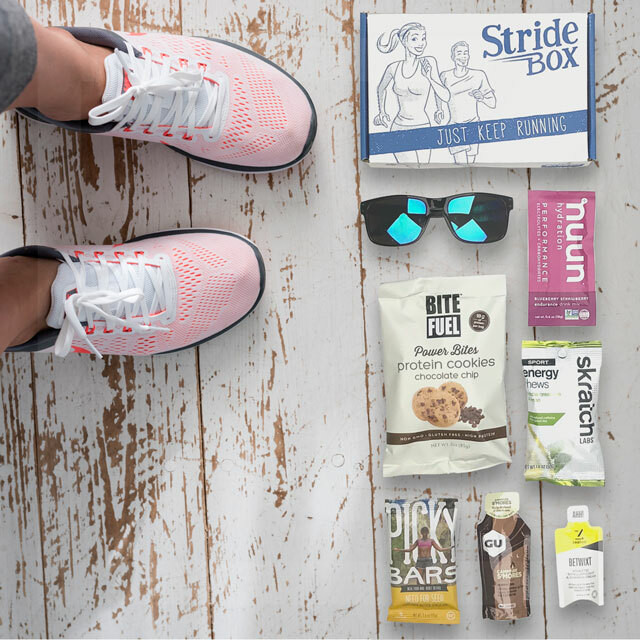 For this fashion layout, we took some of the popular pieces from StrideBox Elite. StrideBox Elite was a project we put together to deliver amazing activewear and running apparel in a surprise package. We’ve recently decided to change the Elite project, so we are liquidating all our leftover stock. We were inspired by all the new technology released at the Consumer Electronics Show last weekend, so we wanted to put together a post of some of our favorite running wearable technology both new, and established. For more info on each piece, click on the blue and white magnifying glass icon. New Wearable Running Tech From CES 2018! 1. Peloton Is Introducing A Treadmill Simply Called The “Tread”! The maker of the Peloton Bike has introduced a Treadmill as part of its assault on the home training industry. Similar to the big, the Peloton Tread features a 32″ big screen that will allow you to stream workouts which are a mix of treadmill running and body weight/dumbbell exercises. The Tread will set you back $3995 + $39/month for the classes. They are taking preorders now! 2. A Headphone That Can Help Your Running Form? Many performance wearables for running attach to leg, or require special shoes. The new wireless headphones from Soul Electronics is looking to change all that. Similar to tech shoes, the Soul earphones can track speed, distance, cadence, step length, step width, vertical oscillation, head tilt angle, stance/flight time, shock, maximum leg force, balance, and consistency. It does so through “Advanced Markerless Gait Capture” It will connect to apps on both iPhone and Android for a complete list of analytics. No word yet on accuracy. 3. For All You Swimmers… Finally, A Smart Swimsuit! When we released the Marathong a couple years ago (on April Fools Day), we had no idea how close we were to a revolution. Now, a company called Spire has teamed up with Swim.com and has announced a smart swim tracker. The tracker itself is not a swimsuit, but a stick on sensor that you can attach to the inside of any swimsuit. You can track time, distance, and even take over the leaderboard at your local pool! The Spire tracker will be released exclusively through SwimOutlet.com. 4. Under Armour Releases Two New Pairs Of “Smart” Running Shoes.. Okay, so maybe “Smart” running shoes aren’t an amazing feat these days. It seems like there’a a device or shoe with some sort of tech around every turn. Under Armour may have found a sweet spot with tech because they’re releasing two new connected running shoes this year. One of our favorite features about these shoes is they can operate without your phone, and then connect and upload the data later. At $140 and $110, The UA HOVR shoes look like a bargain for those who want tech. 5. A “Minimalist” Smart Running Shoe? About 5 years a go, the minimalist shoe movement was all the rage with shoes like Skora becoming very popular for their “barefoot” feel. Well, a company called VivoBarefoot has teamed up with Sensoria fitness to make a minimalist smart shoe. The Sensoria Primus tracks all the normal performance indicators, but packs them in a smaller, more minimalist shoe. 1. The List Is Out! The Most Drug Tested Runners OF 2017! Who knew this was a thing? The USADA just released its list of the most drug tested runners in 2017. The overall winner was Galen Rupp, winner of the Chicago Marathon, and Runner Up at Boston. Rupp was tested 16 times in 2017. The most tested female in the group… Shalane Flanagan and Anjee Wilson (800m Runner) were both tested 12 times. After over 5000 runners were disqualified last year for course cutting or cheating in other ways, The Mexico City Marathon has taken new steps in the quest to stop cheating. First thing they’ll do is stop handing pout medals at the finish line until the runner’s time can be confirmed. This means a delay of a few days before getting a medal. More than 300 runners are banned from running the Marathon on August 28 this year. 3. More Big Bling From Little Rock! The Little Rock (AR) Marathon has set the standard when it comes to big medals! This year is no different as they released their Medieval themed blingin this Facebook Video, and boy is it something to admire. You may have to reinforce your medal hanger. 4. American Runner Wins The Walt Disney World Marathon. For the first time in 14 years an American Runner Nick Hilton won the Walt Disney World Marathon. He is the first American runner to win since 2004, and only the fourth American to win the race in it’s 25 year history. His time of 2:17:52 also qualified him for the Olympic Trials in 2020. 5. A Clever Spoof That Many Of Us Can Relate To. In a past Fast Five, we shared with you a video from our friend Casey Neistattitled “My Addiction” which is all his love for running. Recently, we stumbled across a parody by Citius Mag that showed what many of us really think about when we run. Parody Video Here.